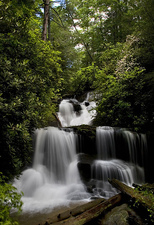 Peter McIntosh Photography - Waterfall. Kurtis Miller Photography - Paddle boarding on the lake. 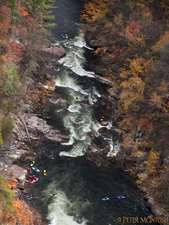 Peter McIntosh Photography - Tallulah Gorge with kayakers coming down the gorge for a whitewater release. 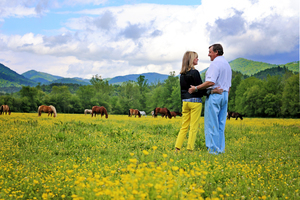 Rabun County is rich in history, beauty, and foods. The Farm-to-Table movement has exploded, and Rabun County has been recognized by the state of Georgia House of Representatives as the Farm-to-Table Capital. As a result, tourism into the area has significantly increased, and much of that has to do with the Tourism Development Authority. Tourism not only increases popularity, but also contributes to the overall financial success of the county itself. It generates revenue for small businesses, as well as supports them. Overall, it's just good for the economy. And it's fun. We were able to get in touch with Teka Earnhadt, the Executive Director of the Tourism Development Authority. She tells us about her own personal story, as well as the benefits of drawing tourism into the area. Kurtis Miller Photography - Couple in field in Dillard, Georgia. TE: I have lived in Rabun County starting my 10th year. We moved here leaving Asheville, NC as my husband was hired by Rabun Gap Nacoochee School. He is the Athletic Director, Head Varsity Football Coach, and Head Varsity Girls Basketball Coach. I have 3 children, Dallas 19, Josie 16, & Luke 12. Dallas is a RGNS graduate and a collegiate athlete playing both football & baseball as a QB & Pitcher at Emory & Henry College in Virginia. Josie & Luke are both student athletes at RGNS. Both playing basketball while Josie also plays volleyball & runs track. Luke adds soccer & baseball to his list of sports. I grew up outside of Charlotte, NC and then graduated from the University of North Carolina at Greensboro. I majored in Business with a concentration in Human Resources with a minor in Economics. I worked in the hospitality industry my whole life as my parents owned several restaurants while I was growing up. After college my husband and I were married and lived in Winston-Salem, NC while he received his masters from Wake Forest University and was a Graduate Assistant Coach for the Demon Deacons Football team. We moved just after his graduation to Ft. Laurderdale, FL where we began our life in the Independent Boarding School World at Pine Crest School. We stayed there for 5 years and decided to move back 'UP South' to be closer to our families and began our journey at the Asheville School in Asheville, NC. We lived and worked at the Asheville School for 7 years and decided we were ready for a change and the opportunity at Rabun Gap presented itself. We were thrilled to have the opportunity to move to the most beautiful place with the warmest and most kind people we have ever been around. 2. What is your role with Rabun County Tourism Development Authority? TE: When we began having our children I decided to stay home with them and leave the workforce. ​I stayed home until my youngest child entered Kindergarten. At that time I was fortunate enough to be able to go to work part time for the Rabun County Tourism Development Authority (when I was hired it was still called the Rabun County Convention & Visitors Bureau). That was 7 years ago this September. I took over as the Executive Director 3 years ago and absolutely love my job. There is not a day that goes by that I don't thank God for letting me work and do something that I love. TE: The Tourism Development Authority was created just over 10 years ago. We are actually a Convention & Visitors Bureau, and that is what we were created as with the title of Rabun County CVB. However, because of our small size of county a lot of people were not exactly sure what we did. Much bigger cities or destinations have large convention centers and have lots of conferences and meetings in their areas. That is just not what Rabun County is. Of course we do have small conferences and meetings but that is not what we really do on a consistent basis. 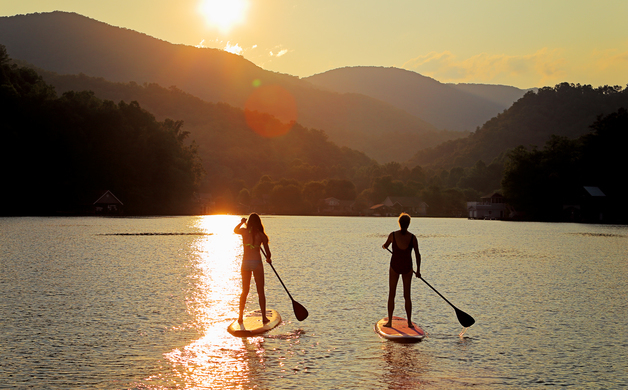 As for that type of tourism we are more the retreat center or fun group getaways that may have a few meetings while they are here.​ Our main form of tourism that we have here in Rabun County are families and friends who come to play, relax, and getaway. About 2 - 3 years ago our State Regional Tourism Representative suggested that some of the smaller CVB's should consider changing their name to Tourism Development Authority so that it is more clear as to what we do. Our board decided that this was a great move for our CVB and we began doing business as the Rabun County Tourism Development Authority. We feel like it has made a big difference in how our own residents see us but also our visitors to the county. Folks now know that we are a resource for our tourism related businesses and our guests to the county enjoying our beautiful area. 4. Why was TDA created? TE: The TDA was created in the beginning out of a need to have one entity that completely and solely promoted tourism for the entire county. There were other groups out there that did some with tourism promotion but they had so many other areas they were involved in that tourism was not their sole priority. With Rabun County having tourism as its #1 industry, the feeling was that it needed to take a priority with one group. That was how the TDA (then the CVB) was created. Our Board of Directors is made up of between 11-15 Tourism-Interested People who have a stake in the Rabun County Tourism Industry and the County. Our board is a completely volunteer board. The TDA has only 1 Full Time Paid employee and that is me. We do hope in the future to add a part-time person to help with some of the office duties but at this time we have not done that. The TDA is funded solely by the collection of Hotel/Motel Tax that the County collects. The best way to describe this and for folks to understand all the different funding sources is this; we only receive money from people who stay overnight in Rabun County hotels, campgrounds, B&B's, & cabins. If you don't spend money on a nights stay in a Rabun County lodging property then you do NOT fund the TDA. The city of Clayton, Dillard, & Sky Valley collect their own H/M tax and pay it to different organizations within their community. We do get a small amount of financial support from both the City of Dillard & the City of Sky Valley. We partner with them on ads and activities quite regularly as well. Basically we make all the money that we receive. It is our job to increase the number of people who stay in our lodging properties. If we don't do that our dollars decrease so we work hard to increase those numbers which in the end helps practically 90% of the businesses in Rabun County by having all those folks here to walk through the doors of those businesses. If you haven't figured it out, Tourism is extremely important to the residents of Rabun County as the majority of working residents need the tourist to patronise their business. Also, because of Tourism each Rabun County household will save approx. $400 each year in their taxes they pay. The taxes paid by tourist keeps the residents from covering that difference. 5. What is the ultimate goal mission of the TDA? TE:The Tourism Development Authority has one and only one mission. That is to bring tourist to Rabun County. There are several ways we do this but the main way is to advertise and market outside the county so that people want to come to the county. Our fabulous businesses and residents take care of the tourist when they get here. My job is to tell them before they ever cross county lines about all the wonderful things to do when they get here. I do my best to show them that in square mileage we may be small, especially with all the protected forest land we have, but we have so much to do that they can plan to stay for many days. Not to mention that our region is fantastic and Rabun County can be their home base while they do things throughout the Northeast Georgia Mountains, Western North Carolina, and into South Carolina. We are completely centrally located for the region and we would love to be their host.​ We also want the residents of Rabun County, especially the tourism-related businesses, to understand that our visitors to the county does not care about city or county lines. We have to promote all of us here to appear bigger. Someone is most likely not going to come for a wine weekend if they think we only have 1 vineyard. But, when they find out we have 3 gorgeous vineyards & 2 distilleries, they take pause and say let's make a weekend of it and book a room, etc. It is about the bigger picture, and that is what we are trying to share and help with here in the entire county. 6. How can someone promote their event or business with TDA? ​TE: The easiest and best way to promote their business, as we know most of our businesses do not have a large advertising budget, is to simply get in contact with me and make sure I know what all their business has to offer. We have a fabulous website, www.ExploreRabun.com that is the #1 referring site for Rabun County Tourism Businesses. Every tourism-related business inside Rabun County gets a FREE listing. It doesn't matter if they are in Clayton, Tallulah Falls, Dillard, Sky Valley, the lakes, or Tiger. If they are a tourism-related business, they can get their business listed. All they have to do is send me a written description of their business/service, contact information, hours of operation, and a few pictures. I will do the rest. They can also send me their events that they host to add to our Calendar of Events. If a tourist/visitor is welcome to attend their event, then I will add them to our calendar. I keep any and all tourism-related events on this calendar. I know many of our local residents use our calendar of events as a resource. Our goal is for all tourism-related businesses to check this calendar often so that when someone walks in their store and says, 'What is there to do here?' they can say, ”Well, we have a tractor pull at the Rabun Arena,” or “There’s a Car race at the WannaGoFast 1/2 mile shootout out at Heaven's Landing​.” Our calendar is packed for almost 9 months out of the year. We also have a visitor’s guide that we produce about every 15-18 months. We do sell the ads in the guide. However, it is a great way to get your businesses information out to thousands and thousands of people. We produce 35,000 printed copies that go out across the state and to anyone who is looking for information about the county. We also have the guide on several websites, including our own, and the state's tourism website for download. Our guide gets downloaded thousands of times each year. This is the only piece that we ask our tourism partners to help with. But, in the end it is helping their business just as much as it helps the Tourism Development Authority. 7. Are there any upcoming events you are hosting that we should know about? Do you host events often? TE: We are not in the creation-of-events-business, but that is not to say that we don't ever. As many people know we hosted and planned the Tallulah Gorge Skywalk Celebration last summer. We also have planned and are hosting the 6 series Grow-Cook-Eat Farm & Food Tours (the next one is September 15th). The reason for having these tours is to continue to promote our designation we received in January 2015 of the Farm to Table Capital of Georgia by the State House of Representatives. We felt that we wanted to showcase our farms and agri-tourism businesses as well as our Farm to Table Restaurants. By having these tours we are able to promote the entire county through our advertising and marketing. It gives us great content to give to bloggers and travel writers in the hopes that they will write about the tours, which in turn promotes a large portion of our community. Again, if we get them here for the tours the attendees will buy gas, stay for dinner, and hopefully stay overnight. It is working as several of our attendees have stayed overnight and these later tours in the series are bringing us repeat attendees who are bringing their friends to participate as well. We hope that the tours grow next year and we are able to get more people and businesses involved. We are in the process of planning for the 2017 August 21st Total Solar Eclipse, as well. Rabun County is in the path of totality and we couldn't be more thrilled. Go to ​http://explorerabun.com/total-eclipse/ and you will see what we have done so far. We are hosting just a couple of the events surrounded by the eclipse. Our hope is, and some have already begun their planning, to have the cities and businesses here in the county plan their own events, whether large or small, and give us the information. We have a page dedicated to the Total Solar Eclipse on our website www.ExploreRabun.com. We are placing all the information surrounding the event on this page so that the visitor can go to one place to plan their visit. TE: As for individual people wanting to get involved and participate with the TDA, please come talk to me. We are always looking for tourism-interested and invested people to serve as board members. We are also always looking for folks who want to be the feet on the streets to help us convey information to businesses, hand out visitors guides to businesses so that they will give them to their customers, be guides on our tours, or help with the events we do plan. If you appreciate tourism, love Rabun County, and enjoy talking and greeting people then you are our kind of people and we would love to have you join our group in some way whether it large or small. A word of caution: It is going to be very tempting for folks to say we are going to rent out our home to visitors to try and make a little money off the event. A word of caution: if you don't have a business license and are registered to pay and are paying hotel/motel taxes to the county or your city, it is illegal to rent out your property. The visitor, not the owner of the property, pays the h/m tax (if a viable business). Consider continuing to promote the county to bring more visitors in a reliable way. If you are interested in finding all varieties of events, feel free to visit our free calendar.